I finally got to go to one of the field camps. Another electrician and I had to go to supply them with generator power and to run all the cable to all the temporary buildings there. 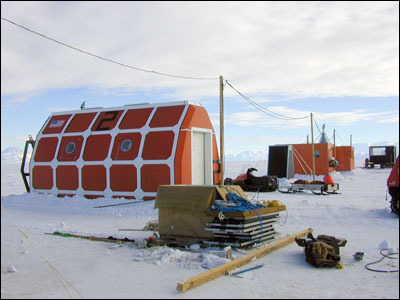 The camp is called Davis Camp and is a research site to study Weddell seals. They are trying to learn their behavior patterns and energy consumption. 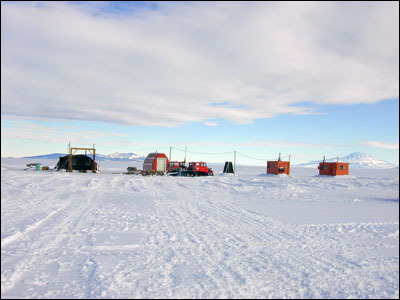 Davis camp is located about 7 miles out on the ice of McMurdo Sound. We rode out there in a vehicle called a spryte, which is a funny little tractor–driven vehicle. It took us about 30 minutes to get there. 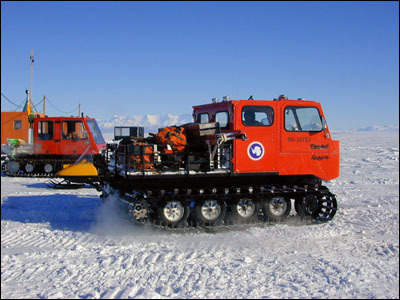 I was supposed to have been to sea ice training school before being allowed out there, but they waived it temporarily as this job desperately needed doing and everyone I was with had been through it. I will still have to do it though. There are 5 temporary buildings set up at this camp. 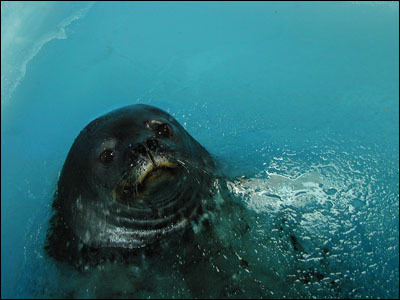 In one of the buildings they drill holes in the ice where the seal can come up to breathe. 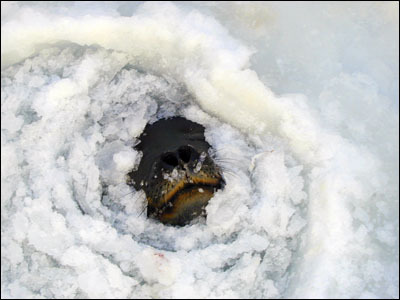 It must be at least 3 miles from any other holes in the ice so that the seal will always come back to these holes to breathe. This way they can monitor them. They then catch a seal, bring him here, weigh him and let him go down into the water. The ice here is about 15 feet thick. 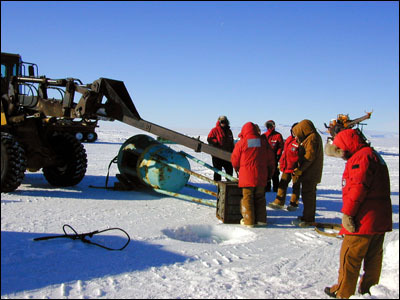 They actually had several holes dug in the ice. Every so often the seal's head would pop up and he would breathe for about a minute. Anyway, they will strap a camera on his back so they can tell where he goes and see what's going on around him. They also have a dome over one of the holes to catch his breath as he exhales. By measuring the amount of carbon dioxide, they can tell how much energy he is using. Very interesting. It was about –30°F. I had been told to dress very warmly and I'm glad I did as we worked outside the major portion of the day. The wind wasn't too bad, but still it was cold. My water bottle was in my pocket and when I went to get a drink, I found it was frozen. I had also brought all of my ECW gear with me in case of any sudden changes in the weather, as we are instructed to do at all times when we are out of town. 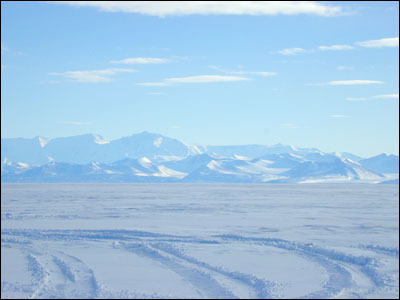 Antarctic weather changes faster than anywhere else on the earth. However, we had nice weather mostly all day. We did get a little wind at one point, but not much. 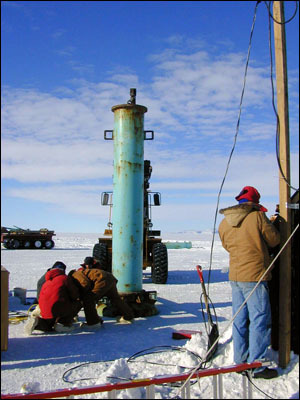 Some of the carpenters drilled holes in the ice and we put up 4"x4"x12' poles to act as electrical poles. We filled around the poles with snow to hold them in place. Then we strung the cable from the generator across all the poles. We also had to run wire in the buildings and put in receptacles and lights. 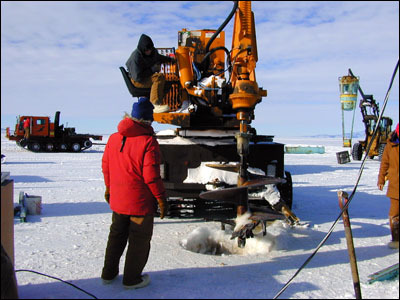 While we were doing this, the scientists drilled another very large hole in the ice and started building an observation tube. They put something resembling a diving bell which has many windows down into the ice and attached a long tube to the top of it. The bell section ends up being about 30 feet under water. Then they can climb down the tube and sit in the bell and observe the seals. There is barely enough room for one person in the bell, and much less in the tube. In fact, when you bend your knees to climb down the ladder, your back and knees are touching opposite walls of the tube. Randall Davis, the leader of this research team, asked if I was claustrophobic. When I said no, he then said I could climb down and observe if I liked. It was so amazing. First of all the color of the water was almost an electric blue. It was like nothing I've ever seen before, and the photos don't begin to come close. The visibility in the water right now is about 300 feet! Really. 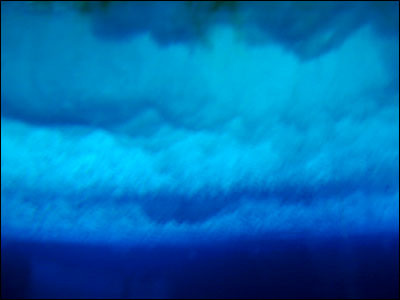 There is no plankton or anything in the water at this time of year, so there is nothing to cloud the water. Also, the light comes through the ice very well. I stayed down there for at least 20 minutes just looking. 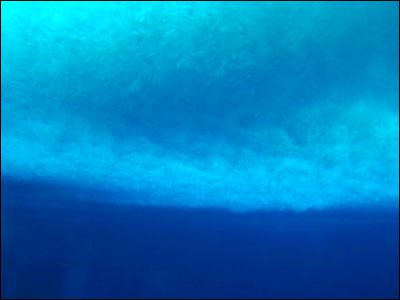 The water depth below me extends 500 meters (about a third of a mile). It was really an amazing experience. I saw a tiny little jellyfish–like creature that was translucent and shaped like a mushroom, including the stem. The cap part opened and closed to propel him through the water. That was the only sea life I saw. The seal avoided coming around the whole time I was down there. Still, it was quite something just to be sitting there. 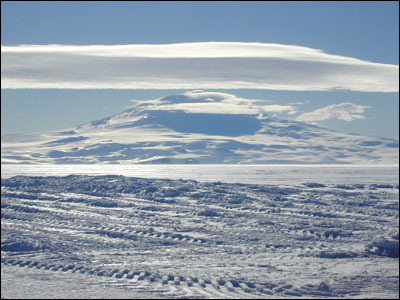 From our vantage point out on the ice, I could finally see Mount Erebus, the world's southern–most active volcano. It always has a steam cloud over the top of it, with other clouds around. Quite beautiful. 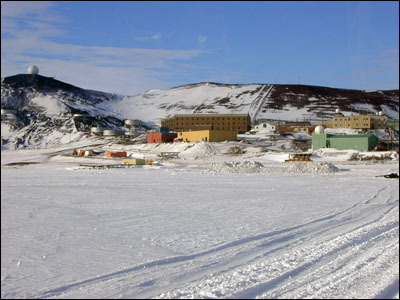 McMurdo Station actually sits on Ross Island between McMurdo Sound and the Ross Sea. Across the Sound from us is the actual mainland of Antarctica. It has many mountains and another volcano called Discovery mountain. It is about 50 miles across the sound and here we were standing out in the middle of it. The 5 buildings set up out there were a jamesway (a canvas Quonset hut), a galley, a research room and sleeping quarters (three bunk beds in a small room), and a storage room. Oh yes, and an outhouse of sorts which is a tiny little space with another hole down into the ice. And let me tell you it is C–O–L–D trying to make use of that place. Once everything is built, the scientists will just live out there for a while. Later in the summer we will have to go take everything down before the ice melts and the sound opens to boats. I only saw one seal. One of the holes had just about frozen over and he could only get his nose up through it. However the hole located in the jamesway was much bigger and he would stick his head and neck up through the hole and breathe. He was totally unafraid of my standing there. I was close enough to touch him, but we are asked not to. He was really beautiful. He would stay up for about a minute. This whole process was a two–day job, but we did come back into town in the evening. 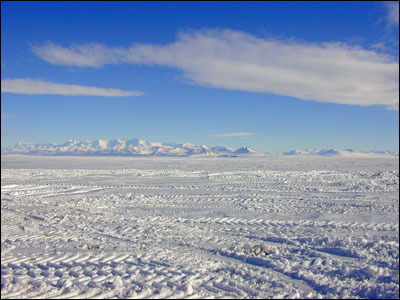 From the vantage point of the sound I was able to get a photo of our town, McMurdo Station. This was really an exciting experience for me — just the kind of thing I came here for. With all the clothes they issued us, I was never uncomfortable working outside. It's really rather amazing. It was wonderful to see different places, to be out on the ice itself, and to get to meet and talk to the scientists that are here doing the research.